Not to be confused with Sanford Stadium. Stanford Stadium is an outdoor athletic stadium in Stanford, California, on the campus of Stanford University. It is the home of the Stanford Cardinal college football team as well as the site of the university's commencement exercises. It opened in 1921 as a football and track stadium, an earthen horseshoe with wooden bleacher seating and flooring upon a steel frame. Its original seating capacity was 60,000, which grew to 89,000 by 1927 as a nearly enclosed bowl. Immediately following the 2005 season, the stadium was demolished and rebuilt as a dual-deck concrete structure, without a track. Today, it seats 50,424. Stanford Stadium was built in five months and opened its gates on November 19, 1921, replacing Stanford Field. The first game was against rival California, who defeated Stanford 42–7 in the Big Game. Seating capacity was originally 60,000, with a 66-row, U-Shaped structure second only to the Yale Bowl in size at the time. In 1925, 10,200 seats were added to the stadium, nearly enclosing the horseshoe while still keeping the overall height of the facility intact. In 1927 14 additional rows of seating were added, increasing the stadium to its maximum capacity of 85,500, with 80 rows of seating. In 1932, the stadium hosted the USA Outdoor Track and Field Championships. In 1935, Stanford Stadium set a record for single-game attendance, with 94,000 spectators filling it for a 13–0 victory over California. In January 1985, Super Bowl XIX was held in Stanford Stadium, with the Bay Area's own San Francisco 49ers defeating the Miami Dolphins, 38–16. Stanford Stadium is one of two venues (the Rose Bowl being the other) to host a Super Bowl without previously serving as the home stadium of a National Football League (NFL) or American Football League (AFL) team. 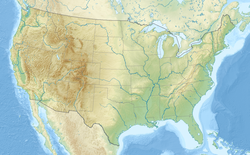 As of now, Super Bowl XIX is the only Super Bowl where the host region saw its team win. On October 22, 1989, the San Francisco 49ers played a home game at the stadium against the New England Patriots, due to damage suffered to Candlestick Park following the Loma Prieta earthquake five days earlier. The stadium has hosted soccer matches for the 1984 Summer Olympics as one of three venues outside southern California for that Olympics, the 1994 FIFA World Cup, and the 1999 FIFA Women's World Cup. Major League Soccer's San Jose Earthquakes have hosted one match at the stadium each year since 2011. The first year's opponent was the New York Red Bulls; since 2012, the Earthquakes have used the stadium to host their home leg of the California Clásico versus the Los Angeles Galaxy. Other high-profile events hosted at Stanford Stadium include Herbert Hoover's acceptance speech for the 1928 Republican Presidential nomination and the 1962 edition of the long-running (1958–1985) series of track meets between the United States and the Soviet Union. The stadium has gone a number of significant renovations since the 1920s. In 1960, a press box was added, while the first, and last synthetic athletics track was installed in 1978 (replacing the cinder track that had been used for many years). In 1985, prior to Super Bowl XIX, the press box was renovated, new locker rooms were installed, a ticket complex and dressing room for game officials were added, and the number of restrooms were increased. In 1994, prior to the 1994 FIFA World Cup, the lower level of the press box was expanded and aluminum benches were installed throughout the stadium. The crown of the playing surface was also reduced. In 1995, a $10 million gift from Los Angeles insurance executive and 1935 Stanford graduate Louis W. Foster enabled further updates to the stadium, including widening the concourse, improving the restrooms, and replacing the remaining wooden seats. In honor of his gift, Stanford named the playing surface the Louis W. Foster Family Field at Stanford Stadium. In June 2005, the university Board of Trustees authorized plans for the stadium's demolition and reconstruction that would remove the track, reduce the stadium capacity, and bring it up to date with present standards for sporting venues. Various justifications for the renovation included poor sightlines in the existing stadium (rendering the bottom 14 rows unusable), long stairways, and lack of adequate restroom facilities. The track around the stadium had previously created a large distance between the field and the spectators. The capacity of the new stadium was set to be approximately 50,000 seats made by Ducharme Seating. The reduction in capacity was a strategic decision by Stanford's Athletics Program to boost season ticket sales and create a more intimate playing atmosphere without sacrificing the ability to host large world-class events, such as the FIFA World Cup in the future. This was partially the result of San Francisco's failure to secure a bid for the 2012 Olympics, which would have featured a renovated Stanford Stadium as the main Olympic Venue. Construction began minutes after the Cardinal's last home game of the 2005 football season, a 38–31 loss to Notre Dame on November 26. Bulldozers began tearing out the natural field turf in a ceremony held while attendees were still in the stadium for the game. Construction proceeded quickly through the winter and spring with the goal of opening in time for Stanford's game against San Jose State on September 9, 2006, but the game had to be relocated to San Jose State's Spartan Stadium due to an unusually wet winter and resulting construction delays. In the summer of 2006, a construction worker fell 23 feet (7.0 m) to his death. 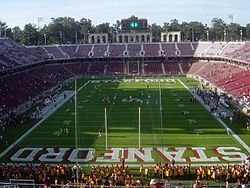 The stadium opened on September 16, 2006 with Stanford losing to Navy 37–9. The Stanford Band was not present at the stadium opening since they were not permitted to play at any athletic events in the month of September due to accusations of vandalism to a temporary trailer which formerly served as their rehearsal facility. Instead, the Navy band performed at halftime and played throughout the game. The facility occupies 18.4 acres (74,000 m2), with a footprint of 601,128 sq ft (55,847 m2)., a playing surface 29 feet (8.8 m) below ground level, and is now a rectangle shape stadium. The stadium has 43 rows on the sides, 22 rows on the endzones, and 30 rows below the skybox. The skybox also has 437 spectator seats, more than double the number of the previous press box. The 2008 Stanford-USC game marked the first sellout of the new Stanford Stadium since it opened in 2006. In 2013, Stanford upgraded their scoreboards with twin high-definition video boards. Also, a 1,673-foot ribbon board was added, which displays out-of-town scores and real-time statistics. ^ a b "Stanford Stadium". Stanford Cardinal. Retrieved January 2, 2018. ^ "Stanford University Directory". Sports Network. Archived from the original on October 19, 2014. Retrieved July 24, 2013. ^ "Break Ground for Stanford's Stadium". The Bakersfield Californian. May 31, 1921. Retrieved August 27, 2012. ^ Murphy, Dave (December 3, 2005). "The Inside Dirt / Stanford Stadium Remodel Gets Down to Earth". San Francisco Chronicle. Retrieved December 2, 2012. ^ "1921 Stanford Cardinal Schedule and Results". Sports-reference.com. Retrieved October 3, 2012. ^ "Stanford Stadium nears completion". Spokane Daily Chronicle. August 3, 1921. p. 18. ^ Purdy, Mark (January 15, 1985). "Stanford Stadium: a shallow, undistinguished dish". Beaver County Times. Pennsylvania. Knight-Ridder. p. B3. ^ "Stanford Stadium, then and now". The Ledger. Lakeland, Florida. AP photos. January 18, 1985. p. 4D. ^ "Work of excavation on Stanford Stadium is nearing completion". Berkeley Daily Gazette. September 3, 1921. p. 9. ^ a b "Stanford Stadium to have addition". Berkeley Daily Gazette. May 24, 1927. p. 11. ^ "San Francisco Football Stadiums" (PDF). College Football Historical Society. XV (II): 6. February 2002. ^ Wiley, Don C. (November 21, 1921). "Bears defeat Stanford Indians 42–7 and win Coast grid title". Berkeley Daily Gazette. p. 9. ^ "Huge Stanford Stadium, with seating of 60,000..." Berkeley Daily Gazette. June 13, 1921. p. 8. ^ "Stanford Stadium". Ballparks.com. Archived from the original on 2006-10-30. ^ ""Big Game" sets new records in crowds, thrills". Berkeley Daily Gazette. November 21, 1927. p. 8. ^ 1984 Summer Olympics official report Volume 1. Part 1. pp. 129–31. ^ "Colorful throng out for Hoover". Spokane Daily Chronicle. Associated Press. August 11, 1928. p. 1. ^ Stevenson, Jack (July 23, 1962). "U.S.A. track team runs past Russians at Stanford meet". The Daily Record. Ellensburg, Washington. Associated Press. p. 8. ^ "Yank men tally best score; Russ jumper breaks record". Spokane Daily Chronicle. Associated Press. July 23, 1962. p. 14. ^ a b c "Stanford Stadium". Stanford University. Retrieved March 16, 2011. ^ "Foster gives $10 million to renovate Stanford Stadium" (Press release). Stanford University. February 7, 1994. Retrieved March 16, 2011. ^ "Construction worker dies after falling" (Press release). Stanford University. July 12, 2006. Retrieved March 16, 2011. ^ Wilner, Jon (November 16, 2008). "USC 45, Stanford 23: The Tactics, the Turnovers and That Strange Final Sequence". San Jose Mercury News. Retrieved November 18, 2008. Wikimedia Commons has media related to Stanford Stadium. 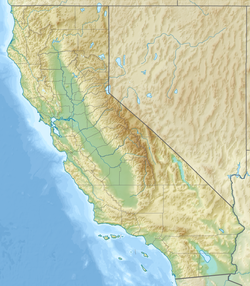 This page was last edited on 5 April 2019, at 03:49 (UTC).